Be the first to share your favorite memory, photo or story of Dee. This memorial page is dedicated for family, friends and future generations to celebrate the life of their loved one. Dee Ion Jett, daughter of Lula and David Jett, Jr., was born January 16, 1954 in Alexandria, Virginia. She departed this life into a peaceful rest on Tuesday, March 13, 2018 at her residence. She received her education from the Alexandria Public School System. At an early age, she gave her life to Christ and joined the Saint John Baptist Church. She was a caregiver and cared for children in her home. She loved spending time with her family especially during Christmas and the holidays. She loved her music, especially her oldies but goodies music, dancing and having a good time. She loved to work word search puzzles and her DVD collection. She loved to cook her special recipes and knitting in her spare time. Above all, she was a devoted mother, sister, aunt and friend. Her loving hospitality was extended to all who entered her home. 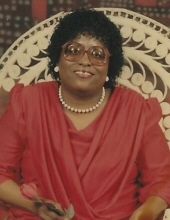 She was preceded in death by her sister Karen P. Jett. She leaves to cherish her memory her parents Lula and David Jett, Jr., of Alexandria, Virginia; her daughter Evette Jett of Alexandria, Virginia, one brother David Jett III, one sister Donna Jett both from Alexandria, Virginia; Two nieces Nikki Jett, Tempestt Boulware both of Alexandria, Virginia; Three nephews Tobias Burt, Taheem Watson, Joshua Kelley all of Alexandria, Virginia; great- niece Caroline Jett of Alexandria, Virginia she raised from a early age, great-niece Zyiah Smith of Washington, D.C., one great-nephew Demir Smith of Washington, D.C., two uncles Maurice E. Jett, Sr. of Brandy wine, Maryland; Norman L. Jett, of Woodbridge, Virginia; and a host of cousins, and family and friends. To send flowers or a remembrance gift to the family of Dee I. Jett, please visit our Tribute Store. "Email Address" would like to share the life celebration of Dee I. Jett. Click on the "link" to go to share a favorite memory or leave a condolence message for the family.